By the way, if you have an Extreme Blue, Extreme Blue Enhanced or even an older Extreme system, check out the special offer for newsletter readers in this newsletter: $50 off new clocks. Windows. You'll need a copy of Windows 8, 7, Vista or XP (with Service Pack 2). Q. What happens if a person enters the wrong employee ID number on the Vetro screen? A. When an employee enters the wrong four-digit code, another person's name will appear on the screen (or the system will tell the user that that ID number has not been assigned to an employee). The system cannot stop the employee from clocking in or out anyway. That's why we strongly suggest using iButtons instead a 4-digit code; the 4-digit ID functionality can be disabled in the Vetro clock, requiring employees to use their iButton to clock in and out. How many hours make up a workweek? 40 hours a week has been the norm, but that's a remnant of industrialization in the 19th Century. A recent survey of US workers found that Americans were on the job 46.7 hours per week. How many hours are ideal? One group says a 30-hour workweek would allow more family time, blunt the endless cycle of earning more to buy more, and redistribute employment more evenly among workers. Then there's "The Four-Hour Workweek," a best-selling book by productivity guru Tim Ferriss, and even the "no-hour" workweek: Betterment, a New York City-based stockbroker, allows workers to set their own schedules, work at home or at the office, and take as much vacation as they see fit. They are also expected to work on projects nights and weekends. Today's saying: "A man with one watch knows what time it is, and a man with two watches can never be sure." TimePilot Q&A: "Graduating" to Extreme Blue Enhanced. TimePilot Lead Story: Introducing Our New Smartphone Apps. 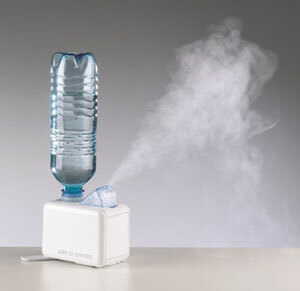 Cool Stuff: Air-O-Swiss Personal Humidifier. The Deal: $50 off Extreme Blue clocks. In this issue we’ll take a look at TimePilot’s new smartphone apps. If you use TimePilot’s Windows-based software, they should look pretty familiar. The apps are free and can be downloaded at Apple’s App Store and Google Play. If you’ve got a smartphone, we urge you to give them a try. If an app isn't for you, delete it from your phone—no damage done. This can get pretty awkward pretty fast, however, especially when you have more than a couple of employees or you aren't around every time they need to clock in or out. That’s why we came up with the weatherproof, battery-powered Extreme Blue clocks (see the special below). Employees clock in and out at the clocks, which hold the data safely in memory until you're ready to collect it with the app. For this article we’re going to use a screenshot from the iPhone® app, but the AndroidTM app looks much the same. You can get complete instructions and screenshots for both app versions here. The home screen is shown at right. Each employee’s name is listed, along with his or her regular and overtime hours. Just as in the TimePilot Central software, if there’s a red triangle next to the employee’s name, they are clocked in, and if there's no triangle, that means they're clocked out. Here’s the good news for those of you who already are using the Enterprise version of our software: You don’t need the Extreme Blue Enhanced Starter Kit, which lists at $849. All you need is Extreme Blue clocks, which cost $449 each (Note: See the newsletter deal below), and the free smartphone app.